The Coolwater in Thailand has directed some of its earnings to local charities in Phuket as part of our community outreach for many years. However, a couple of months ago, we decided to change that and see what we could do for the Hill Tribe children of Northern Thailand, as we are already close to a group of people that take care of them on a regular basis. 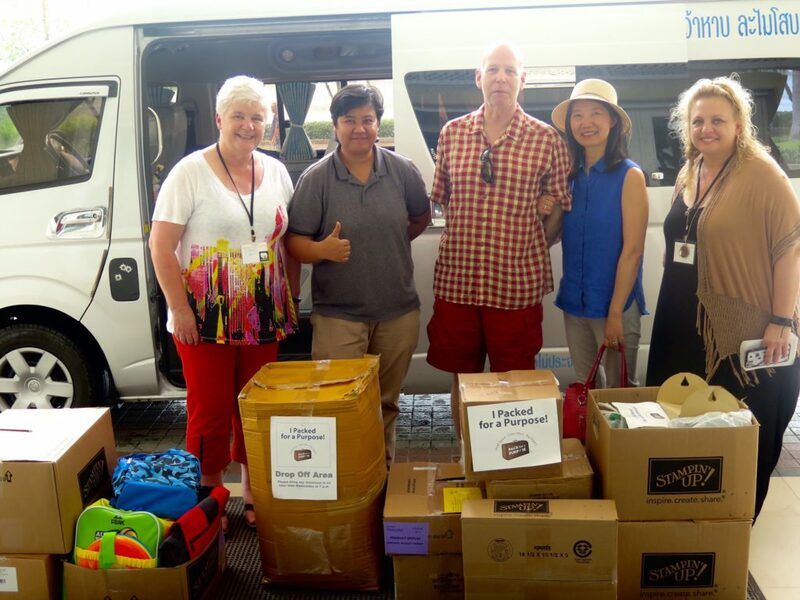 We joined Pack for a Purpose so that our guests could also participate in assisting the Hill Tribe children of Northern Thailand if they choose to. We seeded the new project with some funds of our own and waited to see what would come of it. The Coolwater is a small sleepy operation with only four villas, so we did not have great expectations. We presumed it would take a long time, maybe years to build up any significant contributions. It did not take long at all for us to be wonderfully surprised. Last week, in mid-July, we got a call from Jackie Noble, an Independent Stampin’ Up!® Demonstrator from New Zealand. Jackie and other Independent Stampin’ Up! demonstrators from around the world were staying at a hotel down the road as part of an Incentive Trip they had each earned. Jackie let us know they had assembled some school supplies that we could give the children. They sent us a picture of the supplies and we realised that we could not fit them in a car, so we rented a van and went down to collect them. There we met Jackie and Amy Bickel-Combs from California, USA. They shared their story of how a fellow demonstrator (Lyssa Griffin-Zwolanek from Wisconsin, USA) had initiated a voluntary service project for Trip attendees, and chose a project in Thailand from the Pack for a Purpose website to support. Having the Coolwater nearby as a drop-off point was perfect. 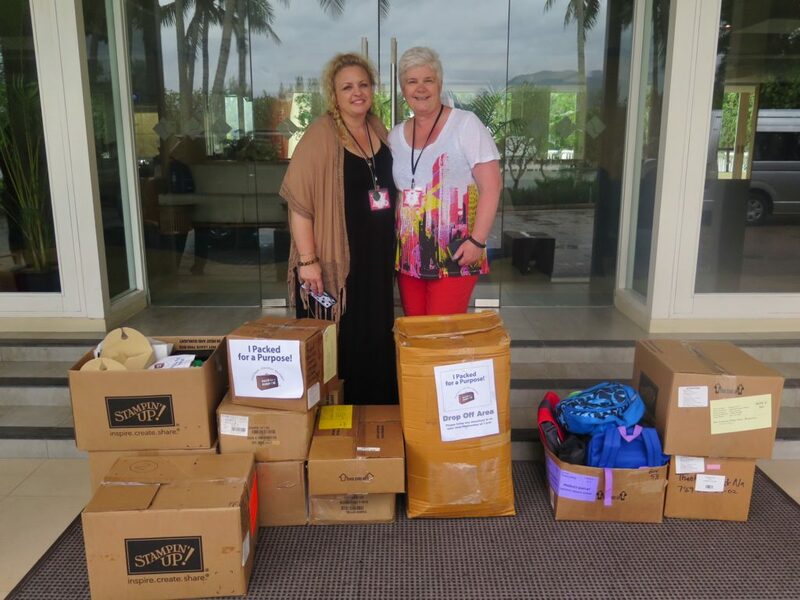 Jackie and Amy with over 130 kg of supplies for the Hill Tribe children. Unfortunately, Lyssa had to withdraw from the trip, but Jackie and Amy took on the organising of the service project to make sure her vision still went ahead. 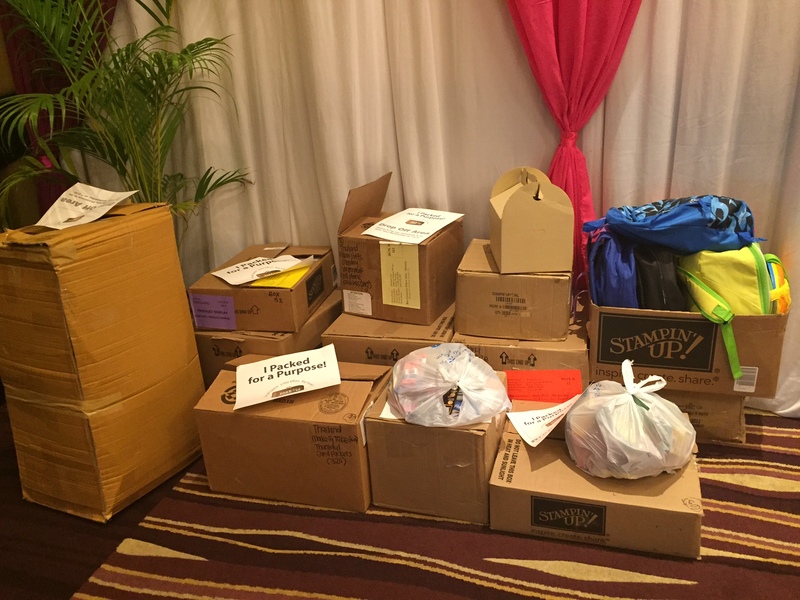 They encouraged other demonstrators from around the globe to use space in their luggage and bring items to be donated to Pack for a Purpose – and they got a great response. They told us how they did this service project as they wanted to do something special while attending their Incentive Trip. They certainly did! I would say they “broke” our system. We just weren’t expecting this magnitude of generosity from anyone. At first glance, it appears that we may now have enough school supplies for an entire year. From now on, we will focus more on getting shoes, socks, clothing, and dry goods. Or if this keeps up, we may just expand our reach. All of us at The Coolwater feel privileged to be a part of this. Congratulations to Lyssa, Jackie, Amy and all the other participating Independent Stampin’ Up! Demonstrators who donated, and the people at Pack for a Purpose for making this possible.